A serious pharmacokinetic interaction between cerivastatin (CER) and gemfibrozil (GEM) has been reported. In the present study, we examined the inhibitory effects of GEM and its metabolites, M3 and gemfibrozil 1-O-β-glucuronide (GEM-1-O-glu), on the uptake of CER by human organic anion transporting polypeptide 2 (OATP2)-expressing cells and its metabolism in cytochrome P450 expression systems. Uptake studies showed that GEM and GEM-1-O-glu significantly inhibited the OATP2-mediated uptake of CER with IC50 values of 72 and 24 μM, respectively. They also inhibited the CYP2C8-mediated metabolism of CER with IC50 values of 28 and 4 μM, respectively, whereas M3 had no effects. 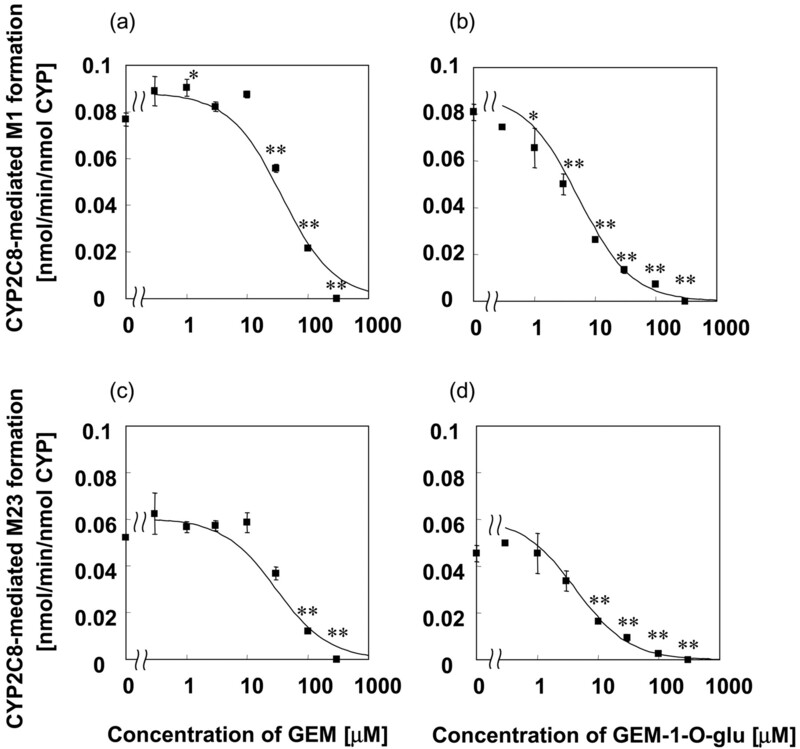 GEM and GEM-1-O-glu minimally inhibited the CYP3A4-mediated metabolism of CER. The IC50 values of GEM and GEM-1-O-glu for the uptake and the metabolism of CER obtained in the present study were lower than their total, and not unbound, plasma concentrations. However, considering the possibly concentrated high unbound concentrations of GEM-1-O-glu in the liver and its relatively larger plasma unbound fraction compared with GEM itself, the glucuronide inhibition of the CYP2C8-mediated metabolism of CER appears to be the main mechanism for the clinically relevant drug-drug interaction. Previously reported clinical drug interaction studies showing that coadministration of GEM with pravastatin or pitavastatin, both of which are known to be cleared from the plasma by the uptake transporters in the liver, only minimally (less than 2-fold) increased the area under the plasma concentration-time curve of these statins, also supported our present conclusion. 3-Hydroxy-3-methylglutaryl CoA reductase inhibitors (statins) and fibrates are now well established treatments for hyperlipidemia to prevent cardiovascular diseases (Wierzbicki et al., 2003). Statins are principally used to reduce low density lipoprotein and also triglycerides in proportion to their low density lipoprotein-lowering efficacy and the baseline triglyceride level, whereas fibrates are mainly used for the treatment of hypertriglyceridemia or as second-line agents in patients with statin intolerance (Moghadasian et al., 2000; Wierzbicki et al., 2003). The combination therapy of statins and fibrates is widely used in clinical practice; however, there are reports of rhabdomyolysis by this combination therapy, mainly involving gemfibrozil (GEM) with lovastatin and cerivastatin (CER) (Abdul-Ghaffar and El-Sonbaty, 1995; Bruno-Joyce et al., 2001; Roca et al., 2002). This may be partly due to drug-drug interactions (DDI) caused by events at a pharmacokinetic level, although an event at a pharmacodynamic level, i.e., a strong direct effect on myocytes by combination therapy, may be also involved (Kyrklund et al., 2001; Backman et al., 2002; Matzno et al., 2003). Indeed, concomitant use of GEM markedly increased the area under the plasma concentration-time curve (AUC) of simvastatin acid, lovastatin acid, and CER and produced a small increase in the concentrations of pravastatin and pitavastatin (Backman et al., 2000, 2002; Kyrklund et al., 2001, 2003; Mathew et al., 2004). Staffa et al. (2002) reported that 31 patients taking CER died due to rhabdomyolysis, and 12 of them were concomitantly taking GEM. Due to this severe side effect, CER was voluntarily withdrawn from the world market in August 2001. Reports have appeared describing the mechanism of the pharmacokinetic interaction between CER and GEM (Wen et al., 2001; Prueksaritanont et al., 2002b,c; Wang et al., 2002). In humans, CER is subject to a dual metabolic pathway mediated by CYP2C8 and CYP3A4 (Mück, 2000). Wen et al. (2001) and Wang et al. (2002) reported that GEM inhibits multiple isoforms of cytochromes P450 (P450s), including CYP2C8, but has no inhibitory effect on CYP3A4. Therefore, the inhibition of CYP2C8-mediated metabolism may be one mechanism responsible for this clinically relevant DDI. In addition, Prueksaritanont et al. (2002a) have suggested that UGT-mediated glucuronidation of statins is an important metabolic pathway because they are spontaneously converted to lactones following UGT-mediated glucuronidation. Prueksaritanont et al. (2002b,c) have also reported that GEM inhibits this UGT-mediated glucuronidation of CER as well as P450-mediated oxidation. The inhibition constants (Ki) or the concentrations of inhibitors to produce a 50% reduction in the metabolism of CER (IC50) in their reports were as high as the total plasma concentration of GEM in the therapeutic range (Prueksaritanont et al., 2002b,c; Wang et al., 2002); however, taking the high protein binding of GEM into consideration, the unbound concentration of GEM is much less than the reported Ki or IC50 values (Todd and Ward, 1988; Prueksaritanont et al., 2002c; Wang et al., 2002). We previously reported that CER was actively taken up into the liver via transporter(s) including organic anion transporting polypeptide 2 [OATP2 (OATP1B1); SLC21A6] (Shitara et al., 2003). We investigated the inhibitory effects of cyclosporin A on the transporter-mediated uptake of CER in hepatocytes and showed that cyclosporin A inhibited it without any effects on its metabolism at therapeutic concentrations (Shitara et al., 2003). This partly explained the mechanism responsible for the clinically relevant DDI between CER and cyclosporin A (Shitara et al., 2003); however, there have been no reports of the interaction between GEM and transporters until now. Gemfibrozil 1-O-β-glucuronide (GEM-1-O-glu), a metabolite of GEM, is taken up and accumulates in isolated perfused rat liver (Sallustio et al., 1996; Sabordo et al., 1999, 2000). This uptake is inhibited by coadministration of dibromosulfophthalein and clofibric acid, whereas acetaminophen and its glucuronide produced no inhibition (Sabordo et al., 1999, 2000). These results suggest an involvement of transporter(s) in the hepatic uptake of GEM-1-O-glu, and therefore, GEM-1-O-glu may affect the transporter-mediated uptake of CER. GEM is metabolized to M1–4 by P450s with M3 being the major metabolite (Nakagawa et al., 1991). GEM also undergoes glucuronidation, mainly to GEM-1-O-glu (Nakagawa et al., 1991), and the plasma concentrations of these metabolites are reported to be relatively high (Okerholm et al., 1976; Nakagawa et al., 1991). Therefore, in the present study, we examined the effects of GEM and its major metabolites, M3 and GEM-1-O-glu, on the metabolism and the transporter-mediated uptake of CER to analyze the mechanism of the clinically relevant DDI between CER and GEM. Materials. [14C]CER (2.03 GBq/mmol) and unlabeled CER were kindly provided by Bayer AG (Wuppertal, Germany). GEM was purchased from Sigma-Aldrich (St. Louis, MO). A metabolite of GEM, M3 (purity: 99.6%), was chemically synthesized in KNC Laboratories, Co. Ltd. (Kobe, Japan). GEM-1-O-glu was enzymatically synthesized from GEM. GEM (2 mg/ml) was incubated at 37°C with rat microsomes (3.6 mg of protein/ml) and 5 mg/ml UDP glucuronic acid in 100 mM glycine-NaOH buffer (pH 8.5) supplemented with 20% (w/v) glycerin for 27 h, followed by the addition of 1 N HCl to bring the pH to 4.0. This sample was chromatographed on an ODS column (Cosmosil 75C18-PREP, 300 ml; Nakalai Tesque, Kyoto, Japan) with MeOH/H2O (30:70–80:20, stepwise) as the mobile phase and analyzed by high-performance liquid chromatography (HPLC) using an ODS column (Inertsil ODS-2, ϕ4.6 × 150 mm; GL Sciences, Inc., Tokyo, Japan) with a mobile phase of 0.05% trifluoroacetic acid/acetonitrile (53:47) at a flow rate of 1.0 ml/min. The fraction containing GEM-1-O-glu, detected by its absorbance at 254 nm, was collected and evaporated. The fraction was rechromatographed on an ODS column with MeOH/H2O (50:50–80:20, stepwise) and purified, followed by evaporation, to obtain GEM-1-O-glu. The purity was 99.4% determined by HPLC detected by the absorbance at 230 nm. The chemical structures and molecular weights of M3 and GEM-1-O-glu were confirmed by NMR and mass spectrometry (MS) analyses, respectively. The chemical structures of GEM and its metabolites used in the present study are shown in Fig. 1. All other reagents were of analytical grade. Chemical structures of GEM and its metabolites. a, GEM; b, M3; c, GEM-1-O-glu. Uptake of [14C]CER in OATP2-Expressing Cells. An uptake study of CER in OATP2-expressing cells was conducted in the presence of GEM and its metabolites, M3 and GEM-1-O-glu. The construction of OATP2-expressing Madin-Darby canine kidney (MDCK) cells has been previously described (Sasaki et al., 2002). The uptake of [14C]CER was examined by the method described previously (Shitara et al., 2003). The inhibitors, GEM (0–300 μM), M3 (0–1000 μM), or GEM-1-O-glu (0–300 μM), were added along with [14C]CER when the uptake reaction was initiated. In Vitro Metabolism of CER. 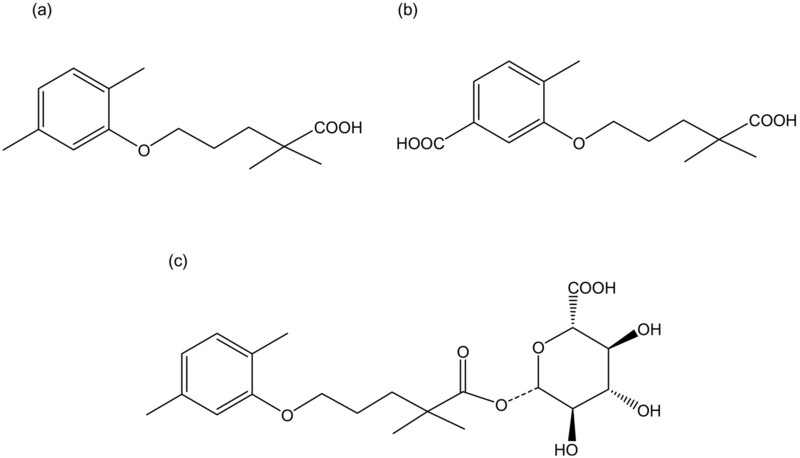 To measure the effect of GEM and its metabolites on the metabolism of [14C]CER and to estimate the contributions of CYP2C8 and 3A4, its in vitro metabolism was examined in CYP2C8- and 3A4-expressing insect cells supplemented with the expression of human P450 reductase and cytochrome b5 (Supersome; BD Gentest, Woburn, MA) and pooled human liver microsomes (HLM; BD Gentest). To estimate the contribution of CYP2C8, HLM was preincubated with a specific inhibitory antibody (Ab) against CYP2C8 (BD Gentest; 0–10 μl/0.1 mg protein HLM) at 4°C for 20 min. To estimate the contribution of CYP3A4, ketoconazole (0–1 μM), a potent CYP3A4 inhibitor, was used. Prior to the metabolism study, human CYP2C8 and 3A4 expression systems (final 20 nM P450) or HLM (final 0.2 mg of protein/ml) were incubated at 37°C for 10 min in 100 mM potassium phosphate buffer (pH 7.4) containing 3.3 mM MgCl2, 3.3 mM glucose 6-phosphate, 0.4 U/ml glucose-6-phosphate dehydrogenase, 1.3 mM NADPH, and 0.8 mM NADH. A 500-μl volume of incubation mixture was transferred to a polyethylene tube, and [14C]CER (0.25 μM) was added to initiate the reaction with GEM, M3, or GEM-1-O-glu (0–300 μM). After incubation for 30 min, the reaction was terminated by the addition of 500 μl of ice-cold acetonitrile because this method had been shown to terminate the enzymatic reaction in a pilot study (data not shown), subsequently followed by centrifugation. To measure the metabolic rate of [14C]CER, the supernatant was collected and concentrated to approximately 20 μl in a centrifugal concentrator (VC-36N; TAITEC, Saitama, Japan), followed by thin-layer chromatography (TLC). The analyte was separated on silica gel 60F254 (Merck KGaA, Darmstadt, Germany) using a suitable mobile phase (toluene/acetone/acetic acid, 70:30:5, v/v). The intensity of the bands for intact [14C]CER and its metabolites separated by TLC was determined by the BAS 2000 system (Fuji Film, Tokyo, Japan). Protein Binding of GEM and Its Metabolites. To estimate the fraction not bound to human serum protein, 300 μM GEM, M3, and GEM-1-O-glu were added to serum (Nissui Pharmaceuticals, Inc., Tokyo, Japan), buffered with 50 mM potassium phosphate at 37°C, and incubated for 2 min. After that, the sample underwent ultrafiltration (Amicon Centrifree; Millipore Corporation, Billerica, MA) and the GEM and its metabolites in the filtrate were determined by HPLC. Phosphate-buffered saline (0.5 ml) containing 5 μl of 1 mM ibuprofen (internal standard) and 20 μl of formic acid were added to 0.5 ml of filtrate, followed by vigorous shaking. Subsequently, the sample was extracted with 5 ml of ethyl acetate/cyclohexane (20:80); then 4 ml of the organic phase was collected and evaporated. The sample obtained was dissolved in 0.5 ml of acetonitrile and separated on an ODS column (Super ODS column, ϕ4.6 × 150 mm; Tosoh, Tokyo, Japan). The mobile phase for GEM was 10 mM acetate buffer (pH 4.7)/acetonitrile (55:45), whereas that for M3 and GEM-1-O-glu was a mixture of 10 mM acetate buffer (pH 4.7) and acetonitrile with a linear gradient from 70 to 55% acetate buffer for 30 min, and the flow rate was 1.0 ml/min for all analyses. The retention times for GEM and ibuprofen were 28 and 13 min, respectively, and those for M3, GEM-1-O-glu, and ibuprofen were 13.5, 10, and 31 min, respectively. The absorbance was measured at 254 nm, and quantitation was carried out by comparison with the absorbance of a standard curve prepared for each compound. Data Analysis. The time courses of the uptake of [14C]CER into OATP2-expressing cells were expressed as the uptake volume (μl/mg protein) of radioactivity taken up into the cells (dpm/mg protein) divided by the concentration of radioactivity in the incubation buffer (dpm/μl). The uptake velocity of [14C]CER was calculated using the uptake volume obtained at 2 min and expressed as the uptake clearance (CLuptake: μl/min/mg protein). The metabolic rate of [14C]CER was calculated by the decrease in unchanged [14C]CER or the formation of its metabolites, M1 and M23. where ΔCLuptake is the CLuptake for OATP2-mediated uptake, which is the CLuptake of [14C]CER minus that estimated in the presence of excess unlabeled CER, ΔCLuptake(+inhibitor) and ΔCLuptake(control) are the ΔCLuptake values estimated in the presence and absence of inhibitors, respectively, and I is the inhibitor concentrations. where v(+inhibitor) and v(control) are the metabolic rates of CER in the presence and absence of inhibitors, respectively. These equations were fitted to the data obtained in the present study using a computerized version of the nonlinear least-squares method, WinNonlin (Pharsight, Mountain View, CA) to obtain the IC50 values with computer-calculated S.D. values. where, RCYP2C8 and RCYP3A4 are the contributions of CYP2C8 and 3A4 to the metabolism of CER (total metabolism and the formations of M1 and M23), respectively, and IC50_2C8 and IC50_3A4 are the IC50 values for CYP2C8- and 3A4-mediated metabolism of CER, respectively. For this simulation, the contributions of CYP2C8 and 3A4 to the formation of M1 and M23 in HLM were calculated based on the contributions of these enzymes to the total metabolism of CER in HLM and the ratio of the initial formation rate of each metabolite in P450 expression systems to that in HLM. Inhibitory Effects of GEM and Its Metabolites on OATP2-Mediated Uptake of [14C]CER. The effects of GEM, M3, and its glucuronide on the OATP2-mediated uptake of [14C]CER were examined (Fig. 2). GEM and GEM-1-O-glu significantly inhibited OATP2-mediated uptake of [14C]CER without any effects on the uptake in vector-transfected cells, whereas M3 did not show a statistically significant inhibition up to a concentration of 1000 μM (Fig. 2). The IC50 values of GEM and GEM-1-O-glu for the OATP2-mediated uptake of [14C]CER were 72.4 ± 28.4 and 24.3 ± 19.8 μM, respectively (mean ± S.D.). Effect of GEM and its metabolites on the OATP2-mediated uptake of [14C]CER. The inhibitory effects of GEM (a), M3 (b), and GEM-1-O-glu (c) on the OATP2-mediated uptake of [14C]CER were examined. Uptake of [14C]CER in OATP2-expressing (▪) and vector-transfected (□) cells in the presence of GEM and its metabolites is shown. Uptake of [14C]CER in the presence of excess unlabeled CER (30 μM) was also examined (▪). Each symbol represents the mean value of three independent experiments ± S.E., and solid lines represent the fitted lines. The asterisks represent a statistically significant difference shown by Dunnett's test (*, p < 0.05; **, p < 0.01). Inhibitory Effects of GEM and its Metabolites on the in Vitro Metabolism of [14C]CER in CYP2C8 and 3A4 Expression Systems. The in vitro metabolism of [14C]CER was examined in CYP2C8 and 3A4 expression systems. In the TLC analysis, one band for parent [14C]CER and two other bands for metabolites were detected in the CYP2C8 expression system, whereas one band for [14C]CER and only one band for a metabolite were detected in the CYP3A4 expression system. The band for one of the metabolites produced by CYP2C8 and CYP3A4 matched, suggesting that these two enzymes produced the same metabolite. This metabolite was identified as M1 and the other was M23. The Rf values for [14C]CER, M1, and M23 were 0.13, 0.09, and 0.055, respectively. In Fig. 3, the metabolism of [14C]CER in the CYP2C8 and 3A4 expression systems in the presence or absence of GEM and its metabolites are shown. GEM and GEM-1-O-glu significantly inhibited the metabolism of [14C]CER in CYP2C8 and 3A4 expression systems, whereas M3 had no effects (Fig. 3). GEM and GEM-1-O-glu preferentially inhibited CYP2C8-mediated metabolism compared with CYP3A4-mediated metabolism (Fig. 3). The IC50 values of GEM and GEM-1-O-glu for the CYP2C8-mediated metabolism were 28.0 ± 4.3 and 4.07 ± 1.23 μM (mean ± S.D. ), respectively, and the corresponding values for the CYP3A4-mediated metabolism were 372 ± 100 and 243 ± 59 μM (mean ± S.D. ), respectively. In Figs. 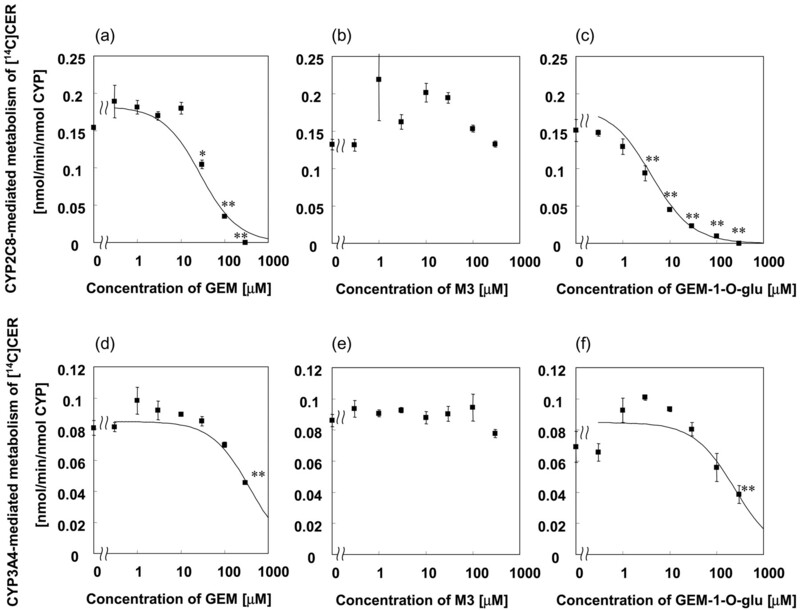 4 and 5, the CYP2C8-mediated M1 and M23 formation rates and the CYP3A4-mediated M1 formation rate in the presence or absence of GEM and GEM-1-O-glu are shown. GEM and GEM-1-O-glu inhibited CYP2C8-mediated M1 formation with IC50 values of 36.8 ± 5.3 and 5.38 ± 1.29 μM (mean ± S.D. ), respectively, and M23 formation with IC50 values of 29.7 ± 4.4 and 4.30 ± 1.48 μM (mean ± S.D. ), respectively (Fig. 4). They slightly inhibited CYP3A4-mediated M1 formation with IC50 values of 406 ± 106 and 267 ± 62 μM (mean ± S.D. ), respectively (Fig. 5). The IC50 values of GEM and GEM-1-O-glu for the OATP2-mediated uptake and the CYP2C8- and 3A4-mediated metabolism of [14C]CER are summarized in Table 1. Effect of GEM and its metabolites on the CYP2C8- and 3A4-mediated metabolism of [14C]CER. Inhibitory effects of GEM (a, d), M3 (b, e), and GEM-1-O-glu (c, f) on the metabolism of [14C]CER in CYP2C8 (a, b, c) and 3A4 (d, e, f) expression systems were examined. Each symbol represents the mean value of three independent experiments ± S.E., and solid lines represent the fitted lines. The asterisks represent a statistically significant difference by Dunnett's test (*, p < 0.05; **, p < 0.01). Effect of GEM and GEM-1-O-glu on the CYP2C8-mediated M1 and M23 formation of [14C]CER. Inhibitory effects of GEM (a, c) and GEM-1-O-glu (b, d) on the CYP2C8-mediated M1 formation (a, b) and M23 formation (c, d) were examined. Each symbol represents the mean value of three independent experiments ± S.E., and solid lines represent the fitted lines. The asterisks represent a statistically significant difference shown by Dunnett's test (*, p < 0.05; **, p < 0.01). Effect of GEM and GEM-1-O-glu on the CYP3A4-mediated M1 and M23 formation of [14C]CER. Inhibitory effects of GEM (a) and GEM-1-O-glu (b) on the CYP3A4-mediated M1 formation were examined. Each symbol represents the mean value of three independent experiments ± S.E., and solid lines represent the fitted lines. The asterisks represent a statistically significant difference shown by Dunnett's test (*, p < 0.05; **, p < 0.01). Estimation of the Contributions of CYP2C8 and 3A4 to the Metabolism of [14C]CER in Pooled HLM. To estimate the contributions of CYP2C8 and 3A4, we examined the effect of a specific inhibitory Ab for CYP2C8 and ketoconazole, a potent inhibitor of CYP3A4, on the metabolism of [14C]CER in the pooled HLM (Fig. 6). Incubation with HLM produced three different metabolites detected by TLC, and one of them (Rf = 0.04) was identified as M24, a metabolite spontaneously produced from M1 and M23. In the present analysis, only the formation of M1 and M23 was analyzed. The inhibitory Ab for CYP2C8 inhibited the microsomal metabolism of [14C]CER in a concentration-dependent manner at low concentrations, and maximum inhibition was obtained at 5 μl/100 μg of microsomes (Fig. 6a). At maximum inhibition, the microsomal metabolism of [14C]CER decreased to 38.9 ± 2.7% (mean ± S.E.) of the control (Fig. 6a), and therefore, the contribution of CYP2C8 was estimated to be 61%. In the presence of inhibitory Ab for CYP2C8, M23 formation was completely inhibited, whereas M1 formation fell only to 61.2 ± 2.9% (mean ± S.E.) of the control (Fig. 6, b and c). 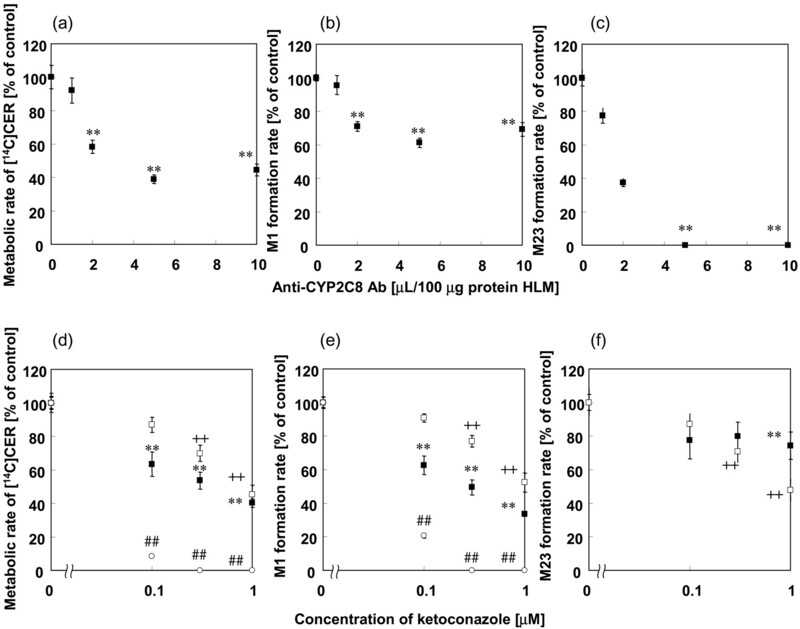 Ketoconazole also reduced the microsomal metabolism of [14C]CER in a concentration-dependent manner (Fig. 6d). However, the inhibition studies using CYP2C8 and 3A4 expression systems showed that it inhibited not only CYP3A4-mediated metabolism but also that mediated by CYP2C8 (Fig. 6d). At 0.1 μM, most of the CYP3A4-mediated metabolism of [14C]CER was inhibited with only a minimal effect on that mediated by CYP2C8 (Fig. 6d); therefore, 0.1 μM ketoconazole was used to estimate the contribution of CYP3A4. It was found that 0.1 μM ketoconazole reduced the metabolism of [14C]CER to 63.4 ± 7.2% (mean ± S.E.) of the control (Fig. 6d), suggesting that the contribution of CYP3A4 was 37%, at most. In addition, 0.1 μM ketoconazole reduced M1 formation to 62.6 ± 5.6% (mean ± S.E.) of the control and slightly, but not significantly, reduced M23 formation to 77.6 ± 11.3% (mean ± S.E.) of the control (Fig. 6, e and f). Effect of specific inhibitory antibody against CYP2C8 (anti-CYP2C8 Ab) and ketoconazole on the metabolism of CER in HLM. The inhibitory effects of anti-CYP2C8 Ab (a) and ketoconazole, a potent CYP3A4 inhibitor (d), on the metabolism of [14C]CER in pooled HLM (▪) were examined. Their effects on M1 formation (b, e) and M23 formation (c, f) are also represented. The effect of ketoconazole on the metabolism of [14C]CER in CYP2C8 (□) and CYP3A4 (○) expression systems was also examined. Each symbol represents the mean value of three independent experiments ± S.E., and solid lines represent the fitted lines. Symbols (*, +, and #) represent a statistically significant difference from the control values shown by Dunnett's test (*, p < 0.05; **, p < 0.01 for the metabolism in HLM; +, p < 0.05; ++, p < 0.01 for CYP2C8-mediated metabolism; and #, p < 0.05; ##, p < 0.01 for CYP3A4-mediated metabolism). Inhibitory Effects of GEM and Its Metabolites on the in Vitro Metabolism of [14C]CER in Pooled HLM. We examined the inhibitory effects of GEM and GEM-1-O-glu on the metabolism of [14C]CER in pooled HLM (Fig. 7). GEM and GEM-1-O-glu inhibited the metabolism of [14C]CER in pooled HLM in a concentration-dependent manner (Fig. 7), whereas M3 had no effects (data not shown). 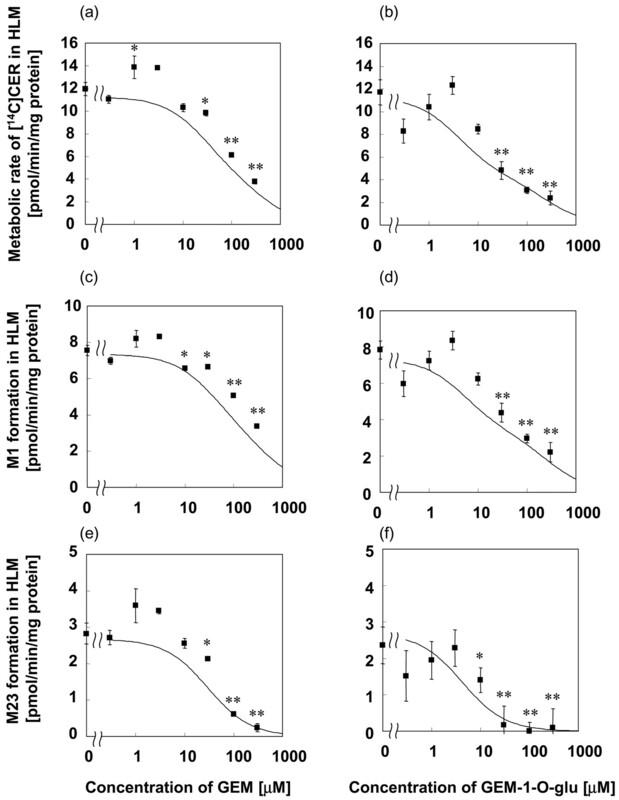 Figure 7 also shows simulation curves for the inhibitory effects of GEM and GEM-1-O-glu in pooled HLM based on eq. 3. Effect of GEM and its metabolites on the metabolism of [14C]CER in HLM. The inhibitory effects of GEM (a, c, e) and GEM-1-O-glu (b, d, f) on the metabolism of [14C]CER (a, b) and the formation of M1 (c, d) and M23 (e, f) in pooled HLM were examined. Each symbol represents the mean value of three independent experiments ± S.E. Solid lines represent simulated lines based on eq. 3. The asterisks represent a statistically significant difference shown by Dunnett's test (*, p < 0.05; **, p < 0.01). Human Serum Protein Binding of GEM and Its Metabolites. We examined the protein binding of GEM and its metabolites in 50 mM phosphate-buffered human serum (pH 7.4). The unbound fractions (fu) of GEM, M3, and GEM-1-O-glu were 0.648 ± 0.037, 1.23 ± 0.00, 11.5 ± 2.3% (mean ± S.E. ), respectively. It has already been reported that GEM is an inhibitor of P450- and UGT-mediated metabolism of CER (Prueksaritanont et al., 2002b,c; Wang et al., 2002). In the present study, we showed that GEM inhibited the OATP2-mediated uptake of CER as well as its metabolism (Fig. 2). The IC50 value of GEM for OATP2-mediated uptake of [14C]CER (72 μM) was similar to, or lower than, the reported IC50 values for metabolism (Prueksaritanont et al., 2002b,c; Wang et al., 2002). We also found that a metabolite of GEM, GEM-1-O-glu, was a potent inhibitor of OATP2-mediated hepatic uptake of CER with a lower IC50 value (24 μM) than that of GEM itself (Fig. 2). This finding was matched by the fact that many glucuronides are recognized by OATP family transporters as substrates and/or inhibitors with a high affinity (König et al., 2000a,b, Cui et al., 2001). We also examined the inhibitory effect of GEM and its metabolites on the CYP2C8- and 3A4-mediated metabolism of [14C]CER. In the present TLC analysis, two clear bands for metabolites were detected in the experiment using the CYP2C8 expression system, whereas only one clear band for the metabolite was detected in the CYP3A4 experiment. Because Wang et al. (2002) reported that CYP2C8 and 3A4 equally catalyzed the formation of M1 although the formation rate of M23 was 14-fold lower in CYP3A4 than in CYP2C8, we identified these two bands as M1 and M23, respectively. The results of the inhibition studies should be discussed in relation to previous reports (Prueksaritanont et al., 2002c; Wang et al., 2002). Wang et al. (2002) reported that GEM inhibited CYP2C8-mediated metabolism of CER to M1 and M23 with IC50 values of 78 and 68 μM, respectively. The corresponding values in the present analysis were 37 and 30 μM, respectively (Fig. 4), and these are comparable with the values reported by Wang et al. (2002). Prueksaritanont et al. (2002c) reported that the IC50 values of GEM for M1 and M23 formations in HLM were 220 and 87 μM, respectively, and Wang et al. (2002) reported the corresponding values to be >250 and 95 μM, respectively. As shown in Fig. 7, we also observed a concentration-dependent reduction in M1 and M23 formation in HLM. The apparent IC50 values of GEM for M1 and M23 formation in HLM was calculated to be 234 and 26 μM, respectively (Fig. 7), and these are also similar to results in previous reports (Prueksaritanont et al., 2002c; Wang et al., 2002). Atypical effects of inhibitors were found in the present study, i.e., M3 apparently activated the CYP2C8-mediated metabolism of [14C]CER at low concentrations, and GEM-1-O-glu activated the CYP3A4-mediated metabolism and M1 formation at low concentrations, whereas it inhibited them at higher concentrations (Figs. 3 and 5), although these activations were not statistically significant with a few exceptions. These atypical effects of inhibitors may be explained by a multisite kinetic analysis involving a mixed effect of GEM and its metabolites as inhibitors and activators of enzymatic reactions (Galetin et al., 2002, 2003). However, in the present study, the enhancing effect was at most 1.5-fold, and this would have only a minimal effect on drug disposition in clinical situations, if any. Therefore, we analyzed the effects of GEM and its metabolites by a simple eq. 2. In the present study, we showed that GEM and GEM-1-O-glu inhibited OATP2-mediated hepatic uptake and metabolism of [14C]CER. Hence, the coadministration of GEM may lead to a DDI due to the inhibition of hepatic uptake and/or metabolism of CER. The possibility of a clinically relevant DDI should be discussed taking the therapeutic concentration of GEM and its metabolites into consideration because the intrinsic hepatic clearance will fall to 1/(1+ I/IC50) of control, where I is the inhibitor concentration (Ueda et al., 2001). In the report by Backman et al. (2002), the mean maximum concentration of GEM after repeated oral administration of 600 mg twice daily was 150 μM. Okerholm et al. (1976) measured the plasma concentrations of free GEM, its glucuronide conjugates, and other metabolites after a single oral administration of 600 mg of [3H]GEM in normal human subjects receiving 600 mg of unlabeled GEM twice daily for 6 days and reported that the maximum concentration of glucuronide conjugates, mainly GEM-1-O-glu, was approximately 20 μM, whereas that of total GEM (GEM + glucuronide conjugate) was approximately 100 μM. Hengy and Kölle (1985) also reported that 10 to 15% of GEM in plasma was present as glucuronide conjugates. The reported values of the total concentrations of GEM and GEM-1-O-glu were similar or higher than the IC50 values for the metabolism and hepatic uptake of CER in the present study. However, because of the high plasma protein binding, the unbound concentrations of GEM and GEM-1-O-glu were at most 0.97 and 2.3 μM, respectively, i.e., less than the IC50 values obtained in the present study. Because only unbound drugs interact with transporters, this result suggests that it is unlikely to cause the reported serious DDI between CER and GEM. However, it is possible that GEM or its metabolites inhibit the metabolism of CER in the liver if they are actively transported to the liver and accumulate there. Indeed, Sallustio et al. (1996) have reported that GEM-1-O-glu is actively taken up by perfused rat liver and the liver/perfusate concentration ratio is 35 to 42. Assuming that it also accumulates in human liver, its unbound concentration there would be higher than the IC50 value for the microsomal metabolism, which gives a 1+ I/IC50 value of 3.1 to 3.2, i.e., more than a 3-fold reduction in the intrinsic hepatic clearance, suggesting that it may cause a serious DDI. In Table 2, the therapeutic total and unbound concentrations in the blood, the estimated unbound concentration in the liver, and the effects on the intrinsic hepatic clearances are summarized. In the present study, GEM and GEM-1-O-glu preferentially inhibited CYP2C8-mediated metabolism of CER compared with CYP3A4-mediated metabolism (Figs. 3, 4, 5). These results support the findings by Backman et al. (2002) who reported that the AUC of M23 was markedly reduced to 17% of the control, whereas that of the open acid form of CER, the lactone form of CER, and M1 were 4.4, 3.5, and 3.5 times higher than the control. Because M23 formation is predominantly mediated by CYP2C8, and not by 3A4, the inhibition of CYP2C8 satisfactorily explains this DDI. In the report by Backman et al. (2002), all the AUC ratios for each of the metabolites to the open acid form of CER fell, following coadministration of GEM, to 82, 8.8, and 80% of the control for M1, M23, and the lactone form of CER, respectively. The slight reduction in the AUC of M1 and the lactone form may be partly due to GEM and GEM-1-O-glu inhibition of the hepatic uptake of CER, followed by M1 and M23 formation and lactonization in the liver. Other statins, including simvastatin, lovastatin, pravastatin, and pitavastatin, are also affected by the coadministration of GEM (Backman et al., 2000, 2002; Kyrklund et al., 2001, 2003; Mathew et al., 2004). GEM increases the AUC of the open acid form of these statins (Backman et al., 2000, 2002; Kyrklund et al., 2001, 2003; Mathew et al., 2004). However, it does not affect the AUC of the lactone form of simvastatin and lovastatin and reduces that of pitavastatin (Backman et al., 2000; Kyrklund et al., 2001; Mathew et al., 2004), and it has no effect at all on the plasma concentration of fluvastatin (Spence et al., 1995). The limited effect of GEM only on the plasma concentrations of the open acid forms of simvastatin and lovastatin can be explained by inhibition of lactone formation followed by UGT-mediated glucuronidation (Prueksaritanont et al., 2002c). The reduced AUC of the lactone form of pitavastatin may also be explained by the same mechanism (Fujino et al., 2003). On the other hand, the increase in the AUC of the open acid forms of pravastatin and pitavastatin may be partly explained by minor inhibition of their OATP2-mediated uptake (Table 2), because these statins are substrates of OATP2 (Hsiang et al., 1999; Nakai et al., 2001; Hirano et al., 2004). GEM increases the AUC of pravastatin and pitavastatin only by 2.0- and 1.5-fold, respectively, whereas it increases that of CER 4.4-fold (Backman et al., 2002; Kyrklund et al., 2003; Mathew et al., 2004). The increase in the AUC of pravastatin can be partly explained by its reduced renal excretion, and therefore, the effect of GEM on its elimination in the liver is weaker (Kyrklund et al., 2003). On the other hand, cyclosporin A, an inhibitor of OATP2, markedly increases the AUC of pravastatin and pitavastatin as well as CER (Regazzi et al., 1993; Hasunuma et al., 2003). The variety of effects on different statins may be due to the fact that GEM and its metabolites inhibit both the uptake and CYP2C8-mediated metabolism of CER in the liver, whereas they inhibit only the hepatic uptake of pravastatin and pitavastatin to a small extent (Table 2); on the other hand, cyclosporin A inhibits their hepatic uptake at therapeutic concentrations (Shitara et al., 2003). In conclusion, we have shown that GEM moderately inhibits, whereas GEM-1-O-glu potently inhibits, the CYP2C8-mediated metabolism, and both moderately inhibit the OATP2-mediated hepatic uptake of drugs. Their inhibition of the CYP2C8-mediated metabolism of CER (mainly by GEM-1-O-glu concentrated in the liver) is a major mechanism that governs the clinically relevant DDI between CER and GEM, whereas their inhibition of the OATP2-mediated hepatic uptake of CER may also contribute to the DDI but to a lesser extent. We are grateful for Bayer AG and Bayer Yakuhin for kindly providing the radiolabeled and unlabeled CER. We are also grateful for Sankyo Co., Ltd. (Tokyo, Japan) and Chemtech Labo. Inc. (Tokyo, Japan) for providing GEM-1-O-glu. We appreciate the generosity of Pharsight Corporation for providing a license for the computer program, WinNonlin, as part of the Pharsight Academic License (PAL) program. This study was supported in part by a grant-in-aid for Young Scientists (B) provided by the Ministry of Education, Culture, Sports, Science and Technology, Japan (Y.Sh. ), a grant-in-aid for the Advanced and Innovational Research Program in Life Sciences from the Ministry of Education, Culture, Sports, Science and Technology, Japan (Y.Su. ), and a Health and Labor Sciences Research grant from the Ministry of Health, Labor and Welfare, Japan, for the Research on Advanced Medical Technology (Y.Su.). ABBREVIATIONS: GEM, gemfibrozil; CER, cerivastatin; DDI, drug-drug interaction; AUC, area under the plasma concentration-time curve; P450, cytochrome P450; UGT, uridine diphosphate glucuronosyltransferase; Ki, inhibition constant; GEM-1-O-glu, gemfibrozil 1-O-β-glucuronide; HPLC, high-performance liquid chromatography; IC50, concentration of inhibitor to produce a 50% reduction in the metabolism or transport; HLM, human liver microsome; Ab, antibody; TLC, thin-layer chromatography; CLuptake, uptake clearance. Abdul-Ghaffar NU and El-Sonbaty MR (1995) Pancreatitis and rhabdomyolysis associated with lovastatin-gemfibrfozil therapy. J Clin Gastroenterol 21: 340–341. Backman JT, Kyrklund C, Kivistö KT, Wang J-S, and Neuvonen PJ (2000) Plasma concentrations of active simvastatin acid are increased by gemfibrozil. Clin Pharmacol Ther 68: 122–129. Backman JT, Kyrklund C, Neuvonen M, and Neuvonen PJ (2002) Gemfibrozil greatly increases plasma concentrations of cerivastatin. Clin Pharmacol Ther 72: 685–691. Bruno-Joyce J, Dugas JM, and MacCausland OE (2001) Cerivastatin and gemfibrozil-associated rhabdomyolysis. Ann Pharmacother 35: 1016–1019. Cui Y, König J, Leier I, Buchholz U, and Keppler D (2001) Hepatic uptake of bilirubin and its conjugates by the human organic anion transporter SLC21A6. J Biol Chem 276: 9626–9630. Fujino H, Yamada I, Shimada S, Yoneda M, and Kojima J (2003) Metabolic fate of pitavastatin, a new inhibitor of HMG-CoA reductase: human UDP-glucuronosyltransferase enzymes involved in lactonization. Xenobiotica 33: 27–41. Galetin A, Clarke SE, and Houston JB (2002) Quinidine and haloperidol as modifiers of CYP3A4 activity: multisite kinetic model approach. Drug Metab Dispos 30: 1512–1522. Galetin A, Clarke SE, and Houston JB (2003) Multisite kinetic analysis of interactions between prototypical CYP3A4 subgroup substrates: midazolam, testosterone and nifedipine. Drug Metab Dispos 31: 1108–1116. Hasunuma T, Nakamura M, Yachi T, Arisawa N, Fukushima K, and Iijima H (2003) The drug-drug interactions of pitavastatin (NK-104), a novel HMG-CoA reductase inhibitor and cyclosporine. J Clin Ther Med 19: 381–389. Hengy H and Kölle EU (1985) Determination of gemfibrozil in plasma by high performance liquid chromatography. Arzneimittelforschung 35: 1637–1639. Hirano M, Maeda K, Shitara Y, and Sugiyama Y (2004) Contribution of OATP2 (OATP1B1) and OATP8 (OATP1B3) to the hepatic uptake of pitavastatin in humans. J Pharmacol Exp Ther, in press. Hsiang B, Zhu Y, Wang Z, Wu Y, Sasseville V, Yang WP, and Kirchgessner TG (1999) A novel human hepatic organic anion transporting polypeptide (OATP2). Identification of a liver-specific human organic anion transporting polypeptide and identification of rat and human hydroxymethylglutaryl-CoA reductase inhibitor transporters. J Biol Chem 274: 37161–37168. König J, Cui Y, Nies AT, and Keppler D (2000a) A novel human organic anion transporting polypeptide localized to the basolateral hepatocyte membrane. Am J Physiol 278: G156–G164. König J, Cui Y, Nies AT, and Keppler D (2000b) Localization and genomic organization of a new hepatocellular organic anion transporting polypeptide. J Biol Chem 275: 23161–23168. Kyrklund C, Backman JT, Kivistö KT, Neuvonen M, Latila J, and Neuvonen PJ (2001) Plasma concentrations of active lovastatin acid are markedly increased by gemfibrozil but not by bezafibrate. Clin Pharmacol Ther 69: 340–345. Kyrklund C, Backman JT, Neuvonen M, and Neuvonen PJ (2003) Gemfibrozil increases plasma pravastatin concentrations and reduces pravastatin renal clearance. Clin Pharmacol Ther 73: 538–544. Mathew P, Cuddy T, Tracewell WG, and Salazar D (2004) An open-label study on the pharmacokinetics (PK) of pitavastatin (NK-104) when administered concomitantly with fenofibrate or gemfibrozil in healthy volunteers (Abstract PI-115). Clin Pharmacol Ther 75: P33. Matzno S, Tazuya-Murayama K, Tanaka H, Yasuda S, Mishima M, Uchida T, Nakabayashi T, and Matsuyama K (2003) Evaluation of the synergistic adverse effects of concomitant therapy with statins and fibrates on rhabdomyolysis. J Pharm Pharmacol 55: 795–802. Moghadasian MH, Mancini GB, and Frohlich JJ (2000) Pharmacotherapy of hypercholesterolaemia: statins in clinical practice. Expert Opin Pharmacother 1: 683–695. Mück W (2000) Clinical pharmacokinetics of cerivastatin. Clin Pharmacokinet 39: 99–116. Nakagawa A, Shigeta A, Iwabuchi H, Horiguchi M, Nakamura K, and Takahagi H (1991) Simultaneous determination of gemfibrozil and its metabolites in plasma and urine by a fully automated high performance liquid chromatographic system. Biomed Chromatogr 5: 68–73. Nakai D, Nakagomi R, Furuta Y, Tokui T, Abe T, Ikeda T, and Nishimura K (2001) Human liver-specific organic anion transporter, LST-1, mediates uptake of pravastatin by human hepatocytes. J Pharmacol Exp Ther 297: 861–867. Okerholm RA, Keeley FJ, Peterson FE, and Glazko AJ (1976) The metabolism of gemfibrozil. Proc R Soc Med 69 (Suppl 2): 11–14. Prueksaritanont T, Subramanian R, Fang X, Ma B, Qiu Y, Lin JH, Pearson PG, and Baillie TA (2002a) Glucuronidation of statins in animals and humans: a novel mechanism of statin lactonization. Drug Metab Dispos 30: 505–512. Prueksaritanont T, Tang C, Qiu Y, Mu L, Subramanian R, and Lin JH (2002b) Effects of fibrates on metabolism of statins in human hepatocytes. Drug Metab Dispos 30: 1280–1287. Prueksaritanont T, Zhao JJ, Ma B, Roadcap BA, Tang C, Qiu Y, Liu L, Lin JH, Pearson G, and Baillie TA (2002c) Mechanistic studies on metabolic interactions between gemfibrozil and statins. J Pharmacol Exp Ther 301: 1042–1051. Regazzi MB, Campana IC, Raddato V, Lesi C, Perani G, Gavazzi A, and Vigano M (1993) Altered disposition of pravastatin following concomitant drug therapy with cyclosporin A in transplant recipients. Transplant Proc 25: 2732–2734. Roca B, Calvo B, and Monferrer R (2002) Severe rhabdomyolysis and cerivastatingemfibrozil combination therapy. Ann Pharmacother 36: 730–731. Sabordo L, Sallustio BC, Evans AM, and Nation RL (1999) Hepatic disposition of the acyl glucuronide1-O-gemfibrozil β-D-glucuronide: effects of dibromosulfophthalein on membrane transport and aglycone formation. J Pharmacol Exp Ther 288: 414–420. Sabordo L, Sallustio BC, Evans AM, and Nation RL (2000) Hepatic disposition of the acyl glucuronide 1-O-gemfibrozil-β-D-glucuronide: effects of clofibric acid, acetaminophen and acetaminophen glucuronide. J Pharmacol Exp Ther 295: 44–50. Sallustio BC, Fairchild BA, Shanahan K, Evans AM, and Nation RL (1996) Disposition of gemfibrozil and gemfibrozil acyl glucuronide in the rat isolated perfused liver. Drug Metab Dispos 24: 984–989. Sasaki M, Suzuki H, Ito K, Abe T, and Sugiyama Y (2002) Transcellular transport of organic anions across double-transfected MDCKII cell monolayer expressing both human organic anion transporting polypeptide (OATP2/SLC21A6) and multidrug resistance associated protein 2 (MRP2/ABCC2). J Biol Chem 277: 6497–6503. Shitara Y, Itoh T, Sato H, Li AP, and Sugiyama Y (2003) Inhibition of transporter-mediated hepatic uptake as a mechanism for drug-drug interaction between cerivastatin and cyclosporin A. J Pharmacol Exp Ther 304: 610–616. Spence JD, Munoz CE, Hendricks L, Latchinian L, and Khouri HE (1995) Pharmacokinetics of the combination of fluvastatin and gemfibrozil. Am J Cardiol 76: 80A–83A. Staffa JA, Chang J, and Green G (2002) Cerivastatin and reports of fatal rhabdomyolysis. N Engl J Med 346: 539–540. Todd PA and Ward A (1988) Gemfibrozil: a review of its pharmacodynamic and pharmacokinetic properties and therapeutic use in dyslipidaemia. Drugs 36: 314–339. Ueda K, Kato Y, Komatsu K, and Sugiyama Y (2001) Inhibition of biliary excretion of methotrexate by probenecid in rats: quantitative prediction of interaction from in vitro data. J Pharmacol Exp Ther 297: 1036–1043. Wang J-S, Neuvonen M, Wen X, Backman JT, and Neuvonen PJ (2002) Gemfibrozil inhibits CYP2C8-mediated cerivastatin metabolism in human liver microsomes. Drug Metab Dispos 30: 1352–1356. Wen X, Wang J-S, Backman JT, Kivistö KT, and Neuvonen PJ (2001) Gemfibrozil is a potent inhibitor of human cytochrome P450 2C9. Drug Metab Dispos 29: 1359–1361. Wierzbicki AS, Mikhalidis DP, Wray R, Schacter M, Cramb R, Simpson WG, and Byrne CB (2003) Statin-fibrate combination: therapy for hyperlipidemia: a review. Curr Med Res Opin 19: 155–168.